Posted on February 15, 2017 by Julie / This entry was posted in Quilting. Bookmark the permalink. Whether the quilt will cover the pillows. If you know what size your quilt is going to be, check out my new, online Quilt Calculator! Crib quilts require careful consideration if they are intended to be used in the crib with the baby. Baby quilts are usually smaller than crib quilts. Throws and lap quilts are entirely up to the creator and/or user although some guidelines are helpful when first learning to quilt. To determine how much overhang, decide where you want the finished quilt to fall on the sides of the bed. If you want the quilt to cover the mattress and box spring sides, measure the height of them. If you have a different spot you want the quilt to fall, measure down from the mattress top to the end of the fall. Multiply the answer by two and add it to the width of the mattress. Add the answer once to the length of the mattress. If you are not able to measure the height of the mattress and box spring, a good rule of thumb is to add 15” to 18” inches to each side of the mattress width to allow for overhang. Mattress thicknesses can vary considerably from 7” to 24”. Adding 18” is a fairly good compromise. If you want the quilt to cover your pillows, add 12-15 inches to the length of your quilt. If you wish, you can measure the height of your pillows to give you the additional amount you need to add to the length. Crib quilts are an exception. It is recommended that a crib quilt not be longer then the crib mattress to avoid having excess material around the baby’s face. Crib quilts should only be wide enough to tuck in lightly on the sides (approximately 4-5” wider than the mattress). Finished crib quilts should be approximately 32” x 52”. Baby quilts are smaller than crib quilts. A good size for baby quilts is 32” x 42”. This is large enough to wrap around an infant or use under the infant when laying down. The width and height are such that it only takes one yard of backing and batting to make the quilt. Throws can be made to cover a couch back, a chair back, or lay over a rocker. They can be any size you desire. Make the size to fit its use by measuring the area you want to cover or make a throw to feature the quilt and don’t worry about the size. Lap quilts can be made to accommodate the intended user. They can vary considerably in size. Small lap quilts for chair use may be 34” x 44” to cover the legs. An average size adult lap quilt may be 46” x 60” to cover more of the body, while a larger, taller adult may like one 54” x 76”. If the quilt is to be shared by two people, you may want to make a wider, longer lap quilt to accommodate. It isn’t difficult to calculate the finished size of a quilt. A quilt made for a bed will need a certain amount of overhang. Quilts for babies and young children need some careful consideration while quilts made for throws, laps or display can be any size desired. Experience is a very good teacher and once you have made a few quilts, you will become adept at determining the finished size of your quilt. 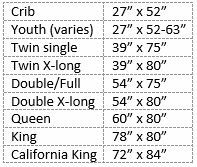 For a quick reference, print off the Quilt Size Guide to have on hand. It contains common mattress sizes and depths as well as the formula for calculating finished quilts for beds.